Stonehenge, located in the county of Wiltshire, England, has long been a source of intrigue for historians, archaeologists and artists alike. The Neolithic monument, a circular succession of 4 metre high, 7 metre wide stones with their accompanying engravings, dates back to around 3100 BC, and is included in a list of World Heritage Sites, as defined by UNESCO. The site is now thought to have once been a burial ground but, for a very long time, its origins were a mystery and an ongoing debate was opened as to whether Stonehenge was built for religious reasons, as a place of healing, as a prehistoric artistic statement, or whether it was simply just a natural phenomenon, and not man-made at all. Merlin is a mythical Welsh figure. As well as Medieval Welsh poetry, he features heavily in Arthurian legend as adviser to the king and mentor to the Knights of the Round Table, and is characterised by his wisdom and vast supernatural abilities. 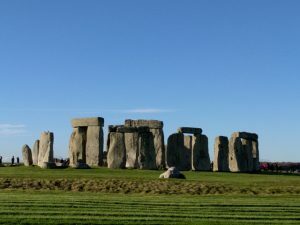 One version of Stonehenge’s origin story details that Merlin built the monument out of magical stones, that he had transported from Mount Killarus in Ireland, in order to provide a worthy place under which to bury England’s dead princes. Other origin stories involving Merlin suggest he had a giant build the monument for him. As discovered by a group of researchers from The Royal College of Art in London, Stonehenge has a pretty impressive acoustic quality. This information has led people to suggest that Stonehenge was built as a creation and performance space for musicians. The stones themselves have been said to ‘sing’ when hit, as opposed to creating the usual ‘thud’ that stones do when they are struck. Though the reasons for the construction of the site are still unknown, its ability to both capture sound and reverberate should certainly be considered.